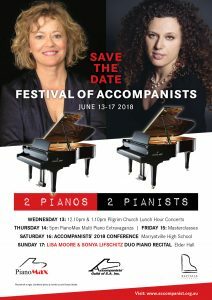 Festival of Accompanists, 13-17 June 2018 – Guest Artists: Piano Duo Lisa Moore & Sonya Lifschitz – The Accompanists’ Guild of SA Inc.
For five days in June 2018 pianists young and old, professionals and students, will create untold excitement on multiple pianos – from two to 32 – uprights, grands and even professional toy pianos in private teaching studios, schools and public performance spaces, culminating with a Celebrity Recital in Elder Hall performed by acclaimed pianists LISA MOORE and SONYA LIFSCHITZ. For just three days – Friday June 15 to Sunday June 17 – Sonya and Lisa will join the Festival for classes at Marryatville High School, followed by the popular annual Accompanists’ Conference and finally perform their duo recital “Handwork” in Elder Hall which is presented in association with Recitals Australia as part of their 2018 Virtuosi Series. Described as “virtuosi maverick Australian-Ukrainian-American pianists” Sonya and Lisa join forces to present a powerhouse journey on two grand pianos with masterwork music, J.S. Bach’s Goldberg Variations (arranged by Australian pianist and composer Stephen Emmerson), the world premiere of a work by a Young South Australian composer, the Adelaide premiere of Martin Bresnick’s mysteriously evocative Handwork and John Adams’ jazz-infused, rollicking Hallelujah Junction. The 2018 Accompanists’ Festival includes a myriad of activities in private studios and public venues before Sonya and Lisa arrive. Many foster the talents of young musicians, including the Guild’s JEMS’ (Primary School Ensemble Musicians) lunch hour concert on Wednesday 13 followed by professionals playing “FOR JEMS” a concert including excerpts from Saint Saëns’ ever-popular Carnival of the Animals. Major sponsor, PianoMax, opens its doors late Thursday afternoon for a Multi Piano Spectacular featuring from two to 32 pianos and the Guild’s Young Accompanists’ Showcase – (Secondary School pianists teamed up with professional musicians) perform during the Saturday Conference. For further general enquiries and ticketing details visit our Accompanist Festival page or please contact the Convenor [email protected].